Nickelodeon, the American cable and satellite television network famous for its shows like SpongeBob and Rugrats, is set to build an underwater resort and theme park on Palawan. The company announced that the park would be a part of a 400-hectare (1,000 acre) undersea development that would showcase the marine life of the area. Fans would also get the chance to interact with the characters the company made famous. According to Ron Johnson, executive vice president for Viacom International Media Networks, Palawan was the chosen location because it is known to have some of the most beautiful beaches in the world today. The project is projected to open in 2020 and would feature restaurants and lounges 20 feet below sea level. The company reiterated that they would advocate ocean protection and conserve coral reefs. However, environmental group Greenpeace expresses worry about the possible destruction of the area’s world-famous marine ecosystem. “It’s sad and alarming because a theme park that big will not promote environmental protection by building those structures,”Vince Cinches of Greenpeace Southeast Asia stated in an interview with AFP. Two UNESCO World Heritage-listed sites, a subterranean river and the Tubbataha coral reefs could all be found in Palawan. Meanwhile, an online petition has circulated online against the construction of the said theme park. 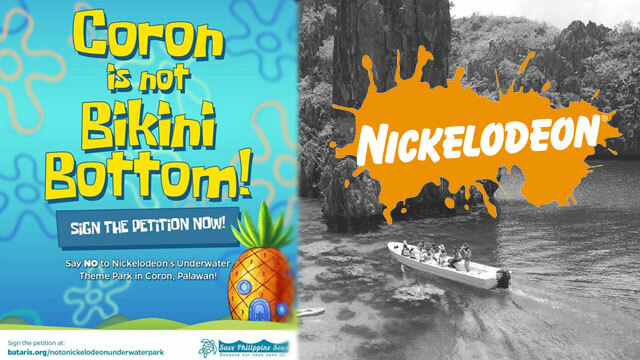 Filipino netizens trended the hash tag #CoronIsNotBikiniBottom referring to the underwater town of Nickelodeon’s famous character, SpongeBob. As of Wednesday afternoon, it has reached 96,000 signatures. Officials in Coron Palawan insisted that they could not comment regarding the issue since they have not received any application for permit from Viacom or its Philippine company partner, Coral World Park. Environment Secretary Gina Lopez announced via DENR’s twitter account that she would not allow such underwater theme park to be constructed in Palawan. Coral World Park insisted that the said project would be a part of the coral reef conservation program and would include a marine sanctuary for species like dolphins and sea cows.